Preheat the oven to 190°C/gas 5. Put the mushrooms in a roasting tin, drizzle over the oil, season, and bake for 6-8 minutes until tender. Remove. Increase the oven to 200°C/gas 6. Melt the butter in a pan over a medium heat. Add the shallot, sauté until soft. Add the Port, increase the heat and simmer until reduced by half. Cool a little. Mix in the Stilton and nuts. Pile into the mushrooms. Bake for 10-15 minutes until bubbling. Make the sauce: melt the butter in a pan over a medium heat. Add the shallot and green leek. Sauté until soft. Add the Port and cook until all the liquid evaporates. Add the cream, simmer until reduced by half. Add the stock, simmer until slightly reduced. Remove from the heat, stir in the watercress. Liquidise, then press through a sieve into a clean pan. Season. Reheat when needed. Heat 2cm vegetable oil in a pan until a cube of bread turns gold in 30 seconds. Add the strips of white leek and fry briefly until crisp. Drain. 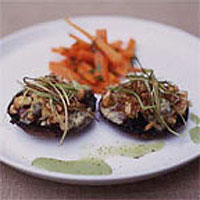 Serve the mushrooms with sauce, garnished with crisp leeks and parsley.